1. Most people know what they 'should' eat to be healthy. Dietitians and nutritionists have been advising people to eat 5+ serves of vegetables a day since... well, forever. But only 7% of Australian's hit that daily target! 2. But it's really become so confusing. One week it seems carbs are good, then they are bad again. It's hard to keep up. My advice? Don't bother. The basics never change. Eat plenty of fruit, veg, whole grains, legumes and healthy fats. Enjoy some dairy and lean protein. Leave alcohol and fast food for special occasions. Move your body daily, in a way you enjoy. 3. There'll always be a new, exotic, overpriced superfood. But the real superfoods are fruit and veg. They're not super trendy, but they're super good-for-you. Forget superfoods. Eat more fruit and veg, not acai berries. It's that simple. 4. You gotta make veggies taste good. Don't skip salad dressing. It makes veggies taste yummy (and helps you absorb nutrients)! Let's keep it real. 'Too much salad dressing' is not the reason we have an 'obesity epidemic'. Click the image for recipe: Chicken Salad with Strawberries + Balsamic dressing. 5. Sugary/fatty junk food (not carbs) make you gain weight. Like Shakira's hips, the statistics don't lie. Ask yourself: Do I eat treat food every day or do I save it for 'sometimes' (like 1-2/wk). Junk food like pizza, chips, chocolate, ice-cream, dessert and alcohol makes you gain weight - not carbs. Most of us could eat far less. My tip? Start small. 6. Carbohydrates are not fattening. 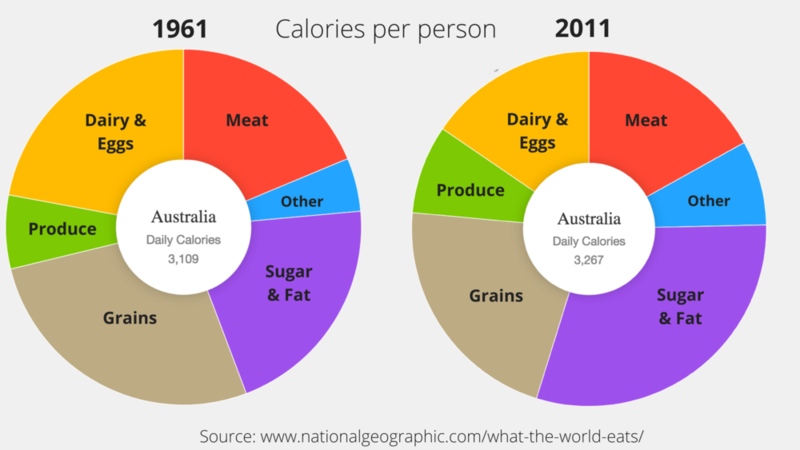 Aussie's are eating fewer grains than ever and still gaining weight (see the graph above)... Carbs are not the problem. Unprocessed carbs are satiating, affordable and really healthy. Want to lose weight? See point 5. 7. Fruit is not fattening, either. ALL fruit is good for you (even the tropical variety). Yes, fruit contains sugar but it's slow burning and whole fruit is packaged full of disease-preventing antioxidants, fibre, micronutrients etc. Bottom line? Fruit is not fattening. 8. Health is a feeling. Not a size. I've met very slim people with very unhealthy habits. And I've met plenty of larger people who live a truly balanced, healthy life. Forget the number, BMI and scales. Lead the healthy life and your weight will find it's happy pace. 9. There are many ways to be healthy. There is no one diet that is perfect for everybody. Any 'expert' who pretends there is only one, magical way is probably just a health blogger (or celebrity) without any qualifications. What's healthy for me may not feel right for you. 10. You are the expert on your body. Accredited nutritionists and dietitians may be the experts on nutrition but you are the expert on your body. Research is emerging but it's a work in progress. We don't have all the answers yet. So get help from an accredited professional who can help you eat the foods that make you feel energetic, alive and well. I've put what I've learned as a dietitian into the Keep It Real Program. It's not a diet. Instead, you'll learn a new approach to food so you can eat healthily (without obsessing) or falling off the bandwagon. With 40+ video tutorials from me, you'll learn everything I teach my clients, but in less time... Learn more. LYNDI COHEN'S QUALIFICATIONS: I'm an Accredited Practising Dietitian and Accredited Nutritionist having graduated with a Bachelor of Nutrition and Dietetics from the University of Newcastle.